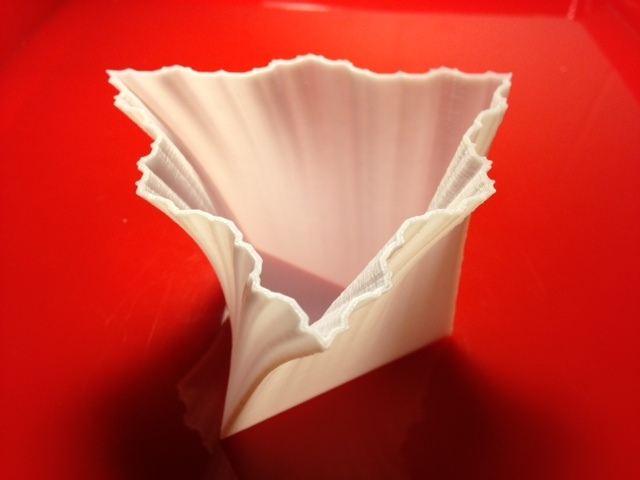 Today I wanted to test out the "shell" setting on the Afinia, so we printed the bottom half of the "trikoch" file from hakalan's Scripted Vases collection on Thingiverse. It is even more beautiful in person than in this picture, although it is very sharp at the top corners! Settings: Afinia "normal" speed with .2mm resolution, <10% for external supports, and "shell" setting checked. I stopped the print before it finished so it would not make the roof layers. Technical notes: When I imported hakalan's trikoch.stl file into the Afinia 3D software it had unfixable normals on the inside of the vase. Autofix did not repair, and printing with "unsolid model" checked led to it printing a solid model. I didn't try printing with "unsolid model" unchecked, though - perhaps that would have worked. Instead I imported into Tinkercad, which made the model solid. I don't know why that happens but in this case it actually helped me! Now exporting from Tinkercad and into the Afinia 3D software worked fine, and I printed using the "shell" setting, stopping before the end to leave the print open. Math note: The original file name has "koch" in it because its shape is based on the famous Koch snowflake curve (although we stopped the print before it took on its usual hexagonal shape, to keep a more triangular theme).